Buying a house as is means purchasing a house in its current condition, without the seller making any repairs or upgrades before closing. 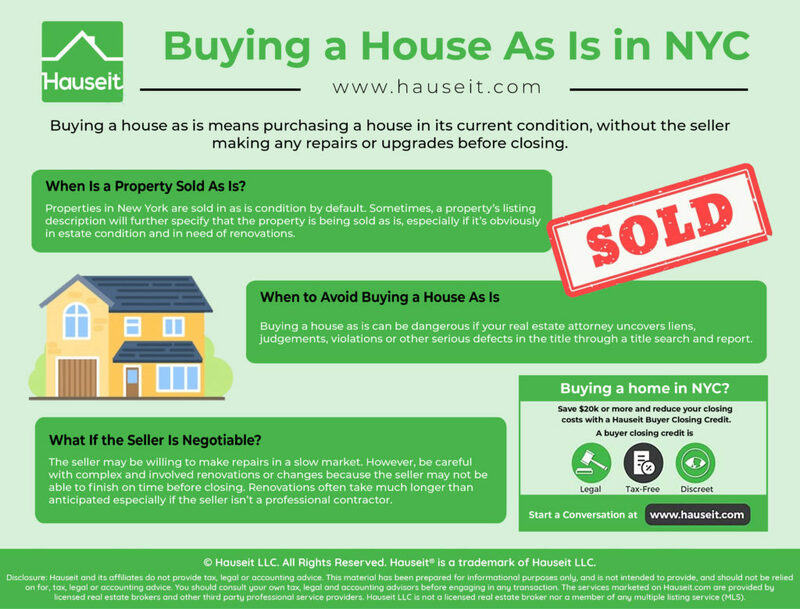 It’s fairly standard in New York for homes to be purchased in as is condition as sellers are typically loathe to do additional work as a condition of closing. When Is a Property Sold As Is? When Are Properties Not Sold As Is? What If the Seller Is Negotiable? 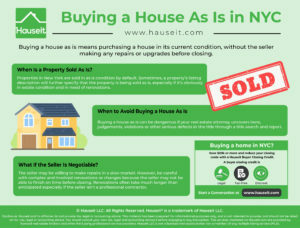 Properties in New York are sold in as is condition by default. Sometimes, a property’s listing description will further specify that the property is being sold as is, especially if it’s obviously in estate condition and in need of renovations. 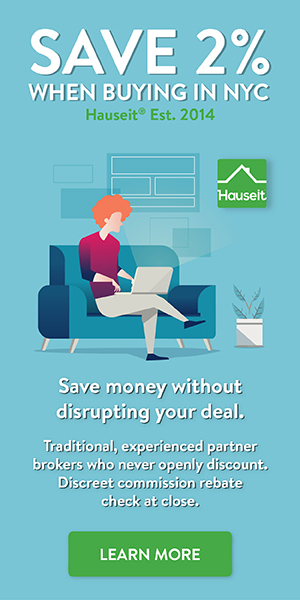 It would be fairly unusual to assume that sellers are handymen or general contractors and would be willing and able to make changes, repairs or upgrades to the apartment for you before closing. Given how painful the renovation process is in NYC, it’d be fair to assume that only the most desperate of sellers would even consider such an option. Therefore, the next time you check out an apartment that could use a facelift, don’t assume the seller will be happy to accommodate your various renovation ideas before closing. If you have renovation ideas, shouldn’t you be the one doing them after you own the place? Pro Tip: Should you renovate before selling in NYC? Read our article to learn whether it makes economic sense to repair or renovate your property before putting it on the market. Buying a new construction home in NYC is unique in that developers will often accommodate reasonable change, repair and sometimes even upgrade requests to various aspects of a new build apartment. The new construction home buying process involves two final walk-throughs, the first to develop a punch-list of mutually agreed upon repairs, and a second to ensure that all changes are done before closing. At the first walk-through, the buyer has an opportunity to inspect the finished or nearly finished apartment and request reasonable changes and fixes. This typically involves fixtures or features that were poorly constructed or clearly broken, such as a faucet handle that doesn’t work or a loose cabinet shelf. It’s reasonable for buyers to ask for fixes when buying a new development unit because the expectation is that they are getting something brand new, which means everything should be working and up to par. Furthermore, new construction buyers are typically paying a premium for brand new apartments with top of the line finishes, materials and appliances. Keep in mind that the changes you request must be reasonable and in line with what the condo or co-op offering plan has promised. For example, if the offering plan states that the kitchen counter-tops will be made of granite, you cannot request the sponsor to replace the kitchen counter-tops with marble. Not only would that be a prohibitively expensive change, it would also be entirely unreasonable of a request to make when that’s not what you paid for. Pro Tip: Sponsors do not have a set timeline to finish your punch-list post-closing if they don’t get a chance to finish before closing. In fact, developers only must make a commercially reasonable effort to address your punch-list within a reasonable amount of time. Buying a house as is can be dangerous if your real estate attorney uncovers liens, judgements, violations or other serious defects in the title through a title search and report. If such material issues are uncovered during due diligence, your lawyer will almost certainly persuade you to not pursue the sale, or at least request that these issues be resolved before closing. You should listen to your real estate attorney because closing on a house with material issues like this may not even be possible, and if it is you risk taking over a whole host of issues from the previous seller. For example, if there is a defect in the title then the seller may not even be the rightful owner of the property. You won’t be able to get title insurance which also means you won’t be able to get a mortgage to buy the house in the first place. Furthermore, even if you could, would you want to pay all cash for a house that you purchased from someone who didn’t have the right to sell it? If there are liens such as tax liens or even mechanic’s liens on a house, then a closing is inadvisable until all liens are cleared up. This may be a tough balancing act as the seller may actually need the proceeds from the sale to pay off the liens. However, if you close with outstanding liens, you risk having the liens then transferred to you and your new property. Not something you want to start your new home with. Even a violation from the NYC Department of Buildings can be a deal killer. If a bathroom, garage or sauna for example was illegally installed without the proper permitting, then you may not be able to get title insurance nor a mortgage. Furthermore, there is a risk that you may be forced in the future to remove or re-do the illegal installation. All of this will cost you time and energy if you somehow manage to go forward with the transaction. Pro Tip: Have you found a house with a ton of issues? Looking to make a low ball offer? 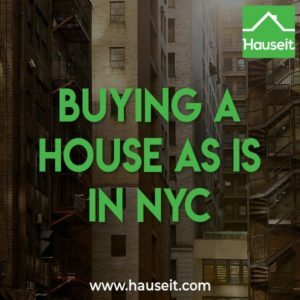 Don’t risk offending the seller by reading our article on what is a reasonable offer on a house in NYC first. In a slow market, sellers of a re-sale apartment that has been on the market for months may be desperate enough to offer fixes and changes before closing. While unusual, this can happen if a seller is desperate and feels like this offer to do work before closing will help entice an otherwise unwilling buyer. Often times, this involves a condo or co-op owner asking the building’s superintendent to help fix a few basic items such as broken doorknobs or shelves, or perhaps a new coat of paint. Sometimes the changes might be more involved such as replacing a slightly cracked window. Be careful with complex and involved renovations or changes because the seller may not be able to finish on time before closing. Remember that renovations often take much longer than anticipated, and that the seller is not a professional contractor. As a result, if you do go this route, try to make any requested changes simple and reasonable so you can close in time! Pro Tip: Are you an opportunistic buyer looking for desperate sellers whose properties have been sitting on the market for months? If so, you’ll want to read our guide on real estate negotiation tips for buyers in NYC.